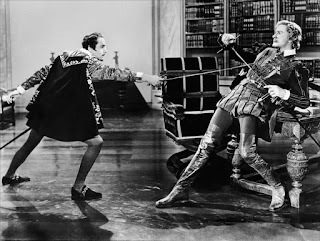 An Errol Flynn swashbuckler, The Sea Hawk combines swordplay, pirates and politics in a story loosely inspired by the contest between England and Spain to rule the world in Elizabethan times. King Philip II of Spain (Montagu Love) dispatches his ambassador Don José Álvarez de Córdoba (Claude Rains) to the court of Queen Elizabeth (Flora Robson). Philip wants Don José to distract Elizabeth into thinking that Spain has no evil intentions, while in reality he is plotting to expand Spain's influence using a powerful armada. England's navy is weak, and Elizabeth is reliant on a small group of independent war ships known as the sea hawks to defend the English channel. Geoffrey Thorpe (Flynn) is one such gentlemanly hawk, and his ship Albatross intercepts and destroys Don José's vessel, and delivers the ambassador and his entourage including Captain López (Gilbert Roland) and niece Doña María (Brenda Marshall) as prisoners to Elizabeth. Despite being on opposing sides, Thorpe and María start to fall in love. But Spain has a powerful ally in the form of Lord Wolfingham (Henry Daniell) embedded in Elizabeth's inner circle, and Philip's plan remains intact. Nevertheless, Elizabeth trusts Thorpe's instincts and agrees to his covert mission to sail to Panama and intercept crucial supplies used by the Spaniards to equip their navy. Thorpe's ambitious ambush goes awry, creating a vacuum in Elizabeth's defences and an opportunity for the Spaniards to strike. 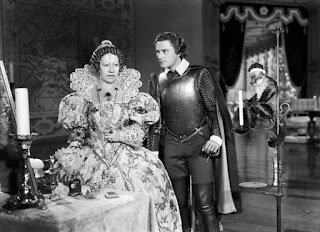 The tenth collaboration between star Errol Flynn and director Michael Curtiz, The Sea Hawk does not disappoint. By now the formula of adventure, sword fights, romance and politics was perfected, and the film breezes through its 127 minutes without a wasted moment. The script credited to Howard Koch and Seton I. Miller keeps the action hopping from sea to shore, and balances the boisterous naval battles with plenty of court intrigue and political maneuvering. Only loosely based on historical events, The Sea Hawk started life as an adaptation of Rafael Sabatini's 1915 novel, and ended up borrowing inspiration from the exploits of Sir Francis Drake. By the time the film was competed and released in 1940, it became a useful opportunity to rally British morale in the early days of World War Two. The film ends with the Queen giving a rousing speech in which she commits to defend freedom at all costs. Errol Flynn is his smoothly charismatic best, although there are elements of going-through-the-motions that do creep into his performance. And even he can't spark the romance, which emerges as the film's weakest link. 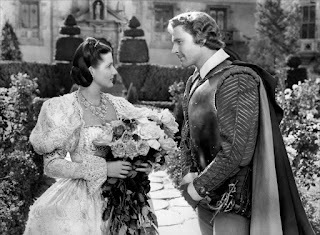 The underwhelming Brenda Marshall struggles for relevance, the role of Doña María simply not developed enough to generate the required passion, and Flynn's eyes seem to ache for Olivia de Havilland. Thorpe and María share the one meaningful romantic scene together, and the rest of their relationship consists of longing from afar and brief moments stolen amidst the unfolding action. Unexpectedly, the more complicated relationship between Thorpe and Elizabeth piques the interest quite a bit more, with Flora Robson biting into the monarch's role with obvious relish. Claude Rains is a reliable conniving politician, while Gilbert Roland and Henry Daniell give the enemies of Thorpe some sharp edges. The supporting case includes Donald Crisp as Sir John, a loyalist member of Elizabeth's circle, Alan Hale as Mr. Pitt, Thorpe's second-in-command, and James Stephenson. The Flynn / Curtiz collaborations are rightly remembered for their impressive action scenes and The Sea Hawk lives up to expectations. The opening attack by Albatross on Don José's ship is a masterpiece of thrilling execution, while the climax features plenty of sword fights to showcase Flynn at his swashbuckling best. Less well acknowledged is the how much attention Flynn's adventures invested in events unfolding far from the battlefields. The Sea Hawk delves into the high stakes games played by Kings, Queens, and their power hungry advisors. As history it may be mostly imaginative, but The Sea Hawk takes the time to reveal the hands that move the chess pieces.